DEAR MAYO CLINIC: Is there a link between traumatic brain injury, or TBI, and depression? Would the treatment for depression in someone with a TBI be different than treatment for depression without this sort of injury? ANSWER: Quite a bit of research has been done on this topic. The results clearly show that when people without any prior mental health concerns or history of depression suffer a traumatic brain injury, their risk for depression increases significantly. Some studies suggest that the risk for developing depression following a traumatic brain injury may be two to five times higher than in the rest of the population. 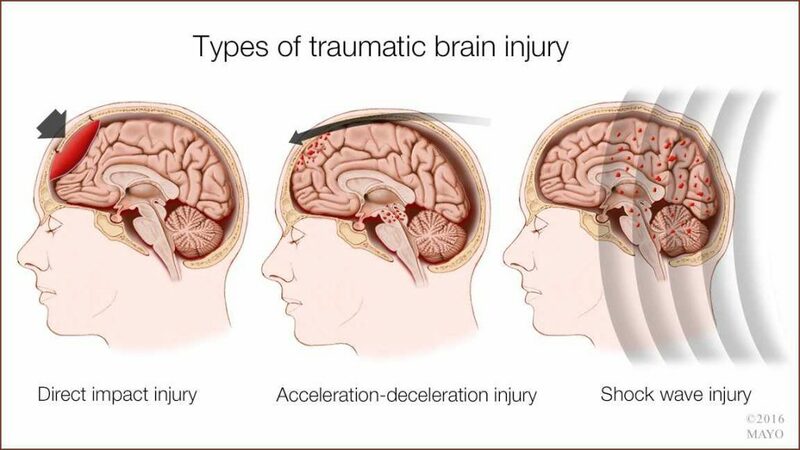 A traumatic brain injury happens when damage to a person’s head or body from an outside force — such as a fall, a vehicle collision or a sports injury — leads to problems with brain functions. A TBI can cause a wide variety of physical symptoms, such as headaches, seizures, weakness, numbness and loss of coordination, to name just a few. These injuries also frequently trigger cognitive or mental symptoms, including confusion, frequent mood changes, memory loss, and difficulty with reasoning or learning. Because the damage that a moderate to severe TBI can cause is far-reaching, most people who have a significant brain injury require comprehensive rehabilitation that includes physical, social and cognitive therapies. The overall goal is to improve their ability to function, so they can perform daily tasks and take part in activities they enjoy. Making progress in rehabilitation can be especially challenging when a TBI is complicated by undiagnosed depression. That’s why it is so important for health care providers to thoroughly screen people with a TBI for depression and to watch for signs of depression during the rehabilitation process. Common symptoms of depression include, among others, persistent feelings of sadness, emptiness or hopelessness; frequent tearfulness, anger, irritability or frustration; loss of interest or pleasure in activities a person usually enjoys; sleep problems; significant fatigue or lack of energy; changes in appetite; feelings of worthlessness or guilt; difficulty concentrating; problems with thinking and memory; and recurrent thoughts of death or suicide. Identifying symptoms of depression in someone who has a TBI can be tricky, because some depression symptoms may be mistaken for symptoms caused by the brain injury. When depression is diagnosed along with a traumatic brain injury, treatment may include antidepressant medication and behavioral therapy — treatment options similar to those recommended for people with depression who are not dealing with a TBI. But, treatment for depression needs to be carefully integrated into the overall TBI treatment plan, so recovery from the brain injury and depression can move forward together. It is also worthwhile to note that TBI is not the only medical condition that can raise a person’s risk for developing depression. For example, cardiovascular disease, stroke and heart attack all can play a role in the onset of depression. If left untreated, depression often can lead to poor outcomes from these health problems, along with a decrease in a person’s quality of life overall.